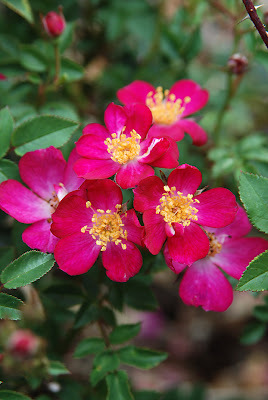 Paul Barden Roses: A new seedling listing on HMF. Are you planning to use this seed-fertile micro in breeding? What are your ideas on possible directions here, if I may ask? Although I might easily employ this in breeding, I haven't, only because I'm really not interested in breeding minis these days. This might be useful in applying a dwarfing effect on much larger varieties, sure, but at this point I am focused on other ideas. I hope your "other ideas" include more new gallicas. I grow all of yours and they are all great! They stand toe to toe with the oldies of that class. Gallicandy is my favorite, but I'm a big fan of pink! Here in the USA miniatures are suffering a dramatic decline in popularity, echoed by the fact that there are only a handful of nurseries now offering them, many of which sell only a dozen or less. Even Nor'East Mini Roses has shut down their retail operation and now sells only wholesale, and is offering fewer than 20 varieties! I think miniatures have seen their heyday and are quickly falling into relative obscurity, so why add more to their number if its unlikely that they will ever get distribution? I still use miniatures in my breeding, but with the intention of breeding other types, not minis. When an interesting mini shows up, I will study it for potential, but minis are not my end goal these days. Paul, if a mini/poly like 'Sweet Chariot' was used as a seed parent (for reasons of space and ease of pot culture), what percentage of its derivatives can be expected NOT to be miniature, if crossed with non-mini pollen? Or is this just impossible to speculate on?